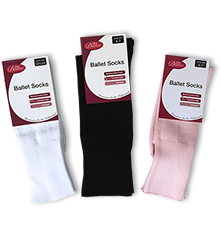 Soft and comfortable fine-knit ballet socks, suitable for both classes and exams. Available in pink, black and white, and in a variety of sizes. Construction: 98% Polyamide, 2% Elastane.